The Wilson Benesch “Resolution” loudspeakers with the carbon fiber Infrasonic Generator were one of the stars of the show. 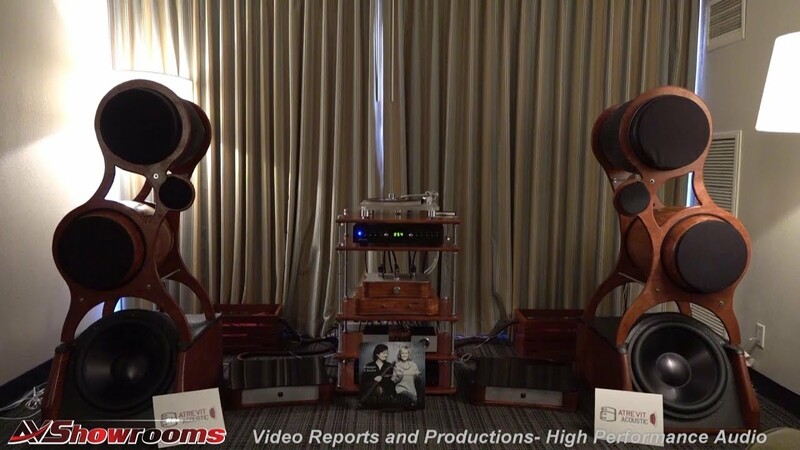 Aside from the beautiful fit and finish, their performance, along with the Ypsilon electronics, achieved one of the best sounding rooms at RMAF 2018. 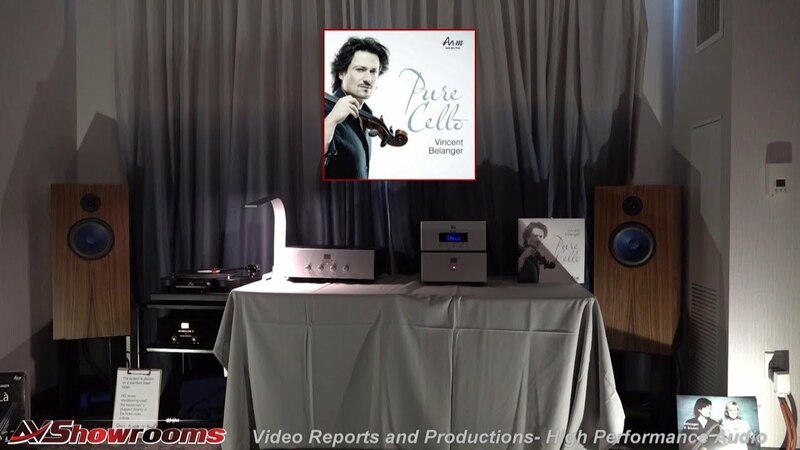 Brian Ackerman, proprietor of Audio Imports, introduces the U.S. debut of the Ypsilon DAC 1000 and in the upcoming video he talks about the features of this new accomplishment from Ypsilon. Playing a track from Dead Can Dance, Brendan Perry’s voice was in the middle of the room. This sound was coherent and musical with pinpoint imaging and excellent detail. Cabling was Stage III Concepts. 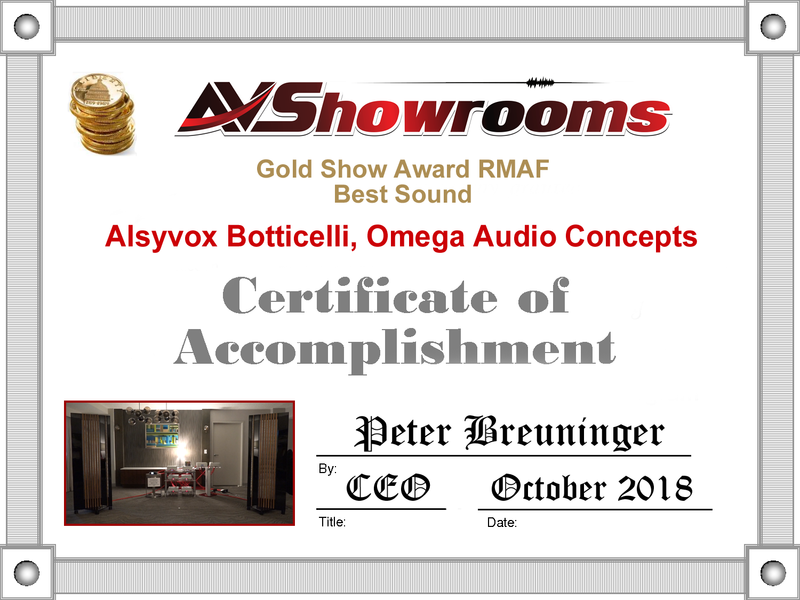 The Alsyvox 3-way Botticelli full range ribbon loudspeakers were accompanied by electronics from Omega Audio Concepts combining beauty with function. Playing MA Recording’s “Nublado” early in the day on Friday, day 1, drives home the fact that great sound can be achieved early in the show with the right equipment and set-up. Music filled the room and music filled me with emotion. The sound was natural, realistic, fast and tight. The Botticelli’s are also beautiful to behold. I’d love to spend more time with these babies. 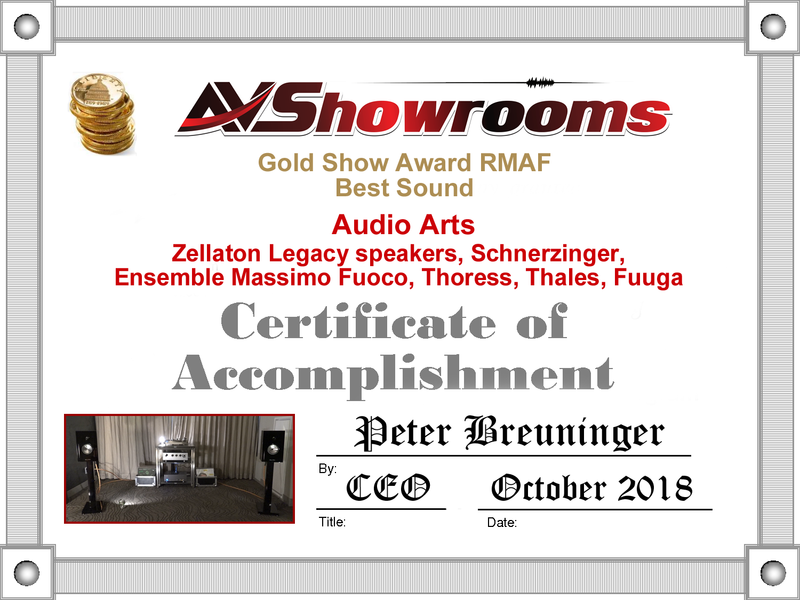 Proprietor, Gideon Schwartz showcased the Zellaton’s Legacy stand-mount loudspeakers, a two-way speaker with an 8” proprietary woofer on the back augmenting the 5” Zellaton driver. These little guys filled the room with the larger Zellaton Statement sonic signature; extremely dynamic, with the same speed and liquidity. Other components in the room were the very impressive Ensemble Massimo Fuoco integrated, hybrid amplifier; the Thoress phono stage powering the Thales turntable with their top-of-the-line Statement tonearm and a Fuuga MC cartridge. 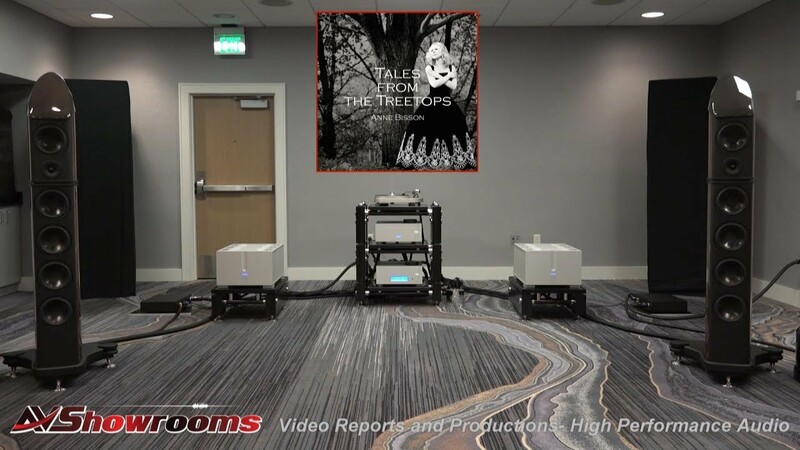 I encourage our viewers to watch this video with these incredible products brought together to achieve one of the best sounding rooms at RMAF 2018. North American Distributor, Kaveh Saffari, introduces the Sigma Acoustics Orchestra 2.3 loudspeakers for the first time in the United States. The designer, Aldo Zaninello, impressed us with his beautiful Italian design of the speaker, but more importantly with the design of the ribbon tweeter giving the high frequencies room to breathe across the top opening up the soundstage. 90.5 dB, easy to drive – tube amplifier friendly. We played percussive, a human voice track and a vocal track. The sound was open and enveloping at the same time. The instruments had proper space between them and the system brought out the detail and vocals perfectly. Associated equipment; the AAvik U300 amplifier, Ansuz cabling, stands by Music Tools from Italy and an Esoteric Cd player. 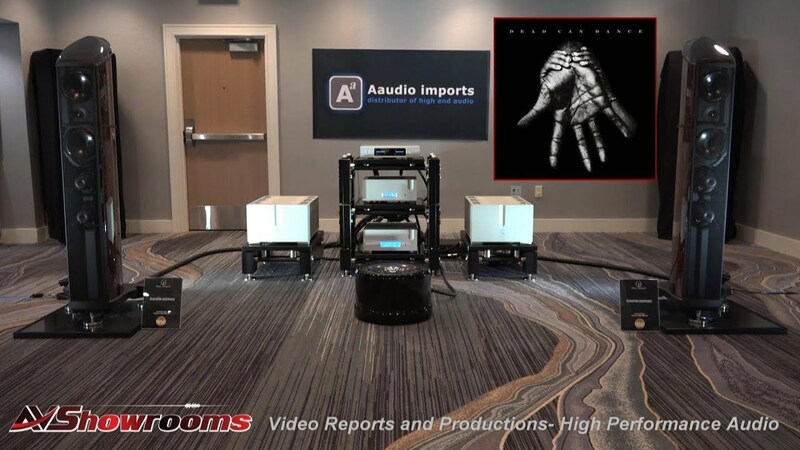 Elliot Goldman, importer and distributor of some of the top brands in high-performance audio, introduced the Goebel Aeon Reference Bending Wave loudspeakers from the Epoque line in its U.S debut. 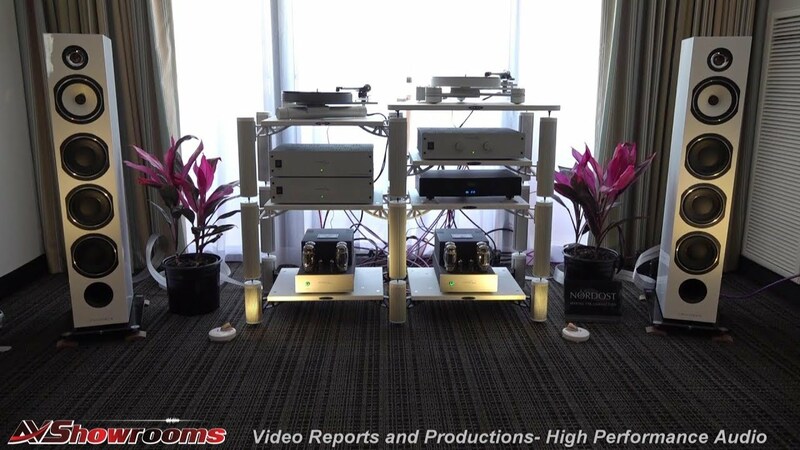 The room featured a vast array of CH Precision electronics including the mono preamplifier, the mono DAC, external power supplies and 2 M1 amplifiers. This system threw a holographic, three dimensional soundstage putting the singer, Michel Jonaz, in the middle of the room. Especially apparent was how the sound of the electric piano popped in the track “Terre”emphasizing its tonality in this already multi-layered sound. It gives me much pleasure to introduce Audio Solutions’ Figaro series loudspeakers from Lithuania, debuted and distributed by Ozan Turan in the United States. One of the unique features of these loudspeakers is that the plywood cabinets are not glued; instead, there’s a self-locking mechanism employed to enhance the bass response. We listened to a track from “Dead Can Dance” and we were both floored that a $15,000 speaker, retail, of this scale, is now available in North America. A more than satisfying low frequency presence and an organic sound in the purist sense with musical involvement that I found to be off-the-charts. 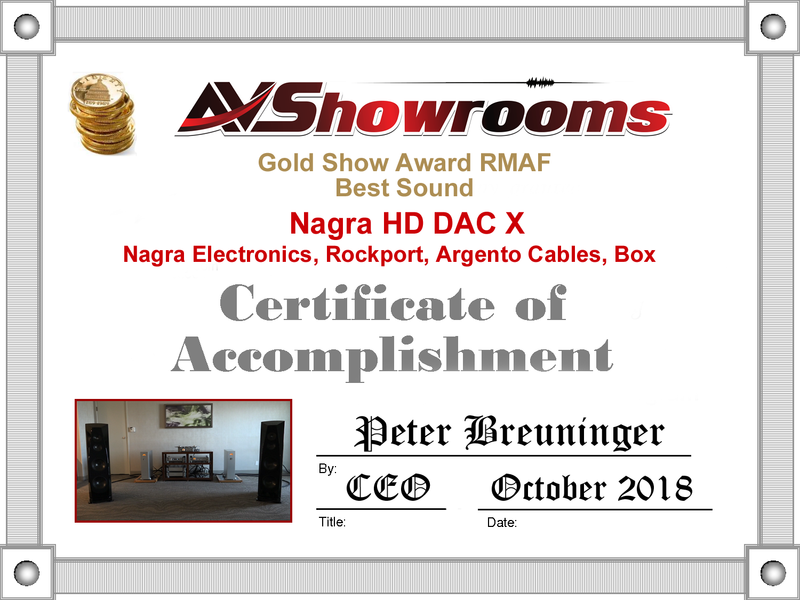 As said in the upcoming video, this rave is not to diminish the performance the smaller, Figaro M at $7500, but the added bass response won the AVShowrooms’ Gold Show award for the XL model. 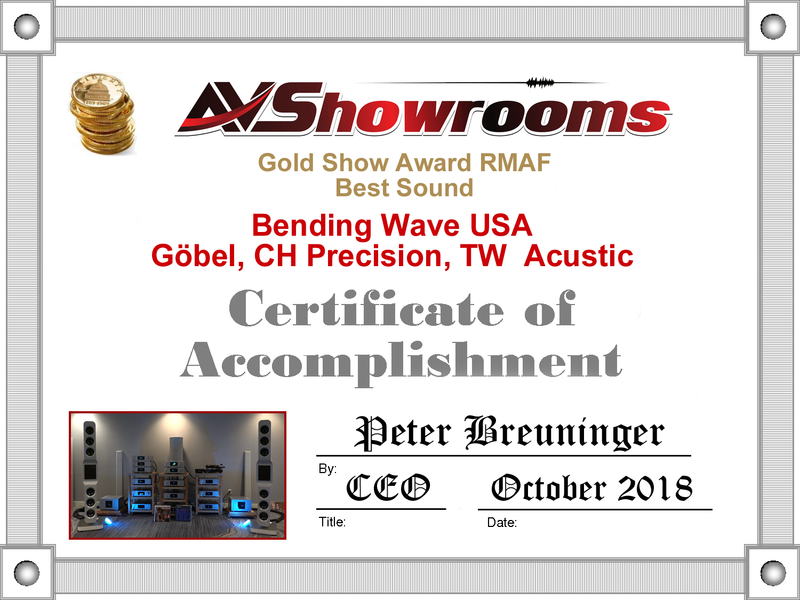 This was my take-home, folks, and this at a show I thought had great sound in so many rooms. The Figaro XL rivaled loudspeakers at the show 10X the price on most every level. The speakers were powered by the Vitus class A integrated amplifier and cabling was by Ansuz. We were fortunate enough to be introduced to the new HD DAC X. In the upcoming show video, Rene Laflamme will explain how much work was done to achieve the end product with optimal results. Our first round of listening was a female vocalist and honestly, I looked twice because I thought Rene was playing tape. The sound was about as close to analogue I’ve heard a CD sound at an audio show. After the song was over, Peter Breuninger commented the same. Quite an accomplishment. Next, Rene played us a jazz piece on tape that was sonically satisfying but the standout was the new DAC. Overall, the sound was effortless with very good tonal quality. Loudspeakers were Rockport’s Cygnus and cabling was Argento Audio. Of course, all of the electronics were Nagra. A debut in the United States by Next Level Hi-Fi in Wayne, Illinois. The Borreson 03 loudspeakers have arrived and meet the exacting standards of their designer, Michael Borreson. Michael painstakingly walks us through his journey to his end creation. The AVShowrooms’ video will delight Borreson fans when he explains in detail the new drivers, the new ribbon tweeter and the new magnet system, along with his concept of the project from beginning to end. We played two male vocal tracks with the C150 Ansuz amplifier powering the speakers. The system was extremely quiet. There was no noise floor. 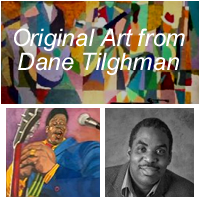 It was organic and detailed without any harshness and delivered music with emotional involvement. 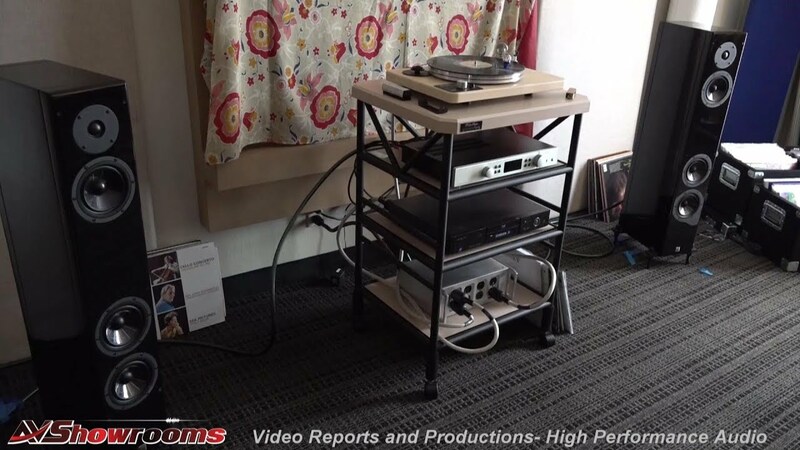 The system included the Ansuz DT-C, top-of-the-line cabling with the Mainz 8 Power Distributor, the Ansuz equipment rack and new P150 stereo amplifier. Michael Vamos, Sales Representative for both Raidho and Scansonic loudspeakers, treated us to one of the biggest surprises at RMAF 2018. Just as I was wrapping up my notes for Reviewers’ View I settled back for a listen. We played Roger Waters “It’s a Miracle” on the Scansonic MB5B and the bass and imaging were that of speakers three times the size. “Giant Killers” was what Michael called them. These slim, little 2.5 way floorstanders will disappear in any size room and they are front-ported giving the listener the ability to move them closer to the wall. The Raidho DNA was apparent, but for a fraction of the price. How about $7500? Anyway, how could I resist adding the Scansonic to my list for the show wrap-up? We were introduced to new SR products at RMAF 2018 including the Galileo SX Cables. These new cables were developed incorporating the technology from the Synergistic Research program that resulted in the all-silver 25th Anniversary SR power cord. 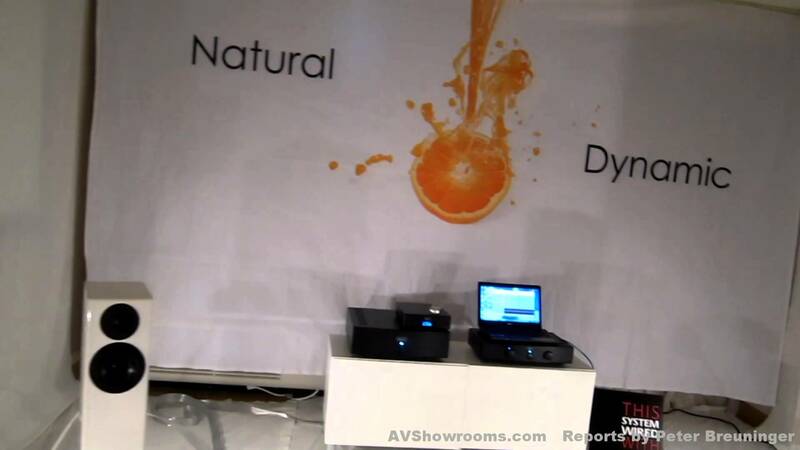 The AVShowrooms’ video will have Ted Denny talking about the components in the system. We played a beautiful version of the “Intermezzo from Carmen” by The All Star Orchestra and were treated to Ted Denney’s demo with the SR technology turned on and off. As promised, with the SR technology turned on, the sound had more clarity and musicality, better resolution and superior imaging. With the SR technology turned off, the sound collapsed and fell into itself. 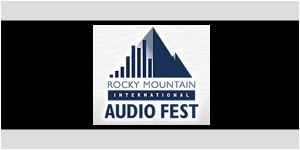 Ever raising the bar, the Synergistic Research team had one of the best sounding rooms at RMAF 2018. 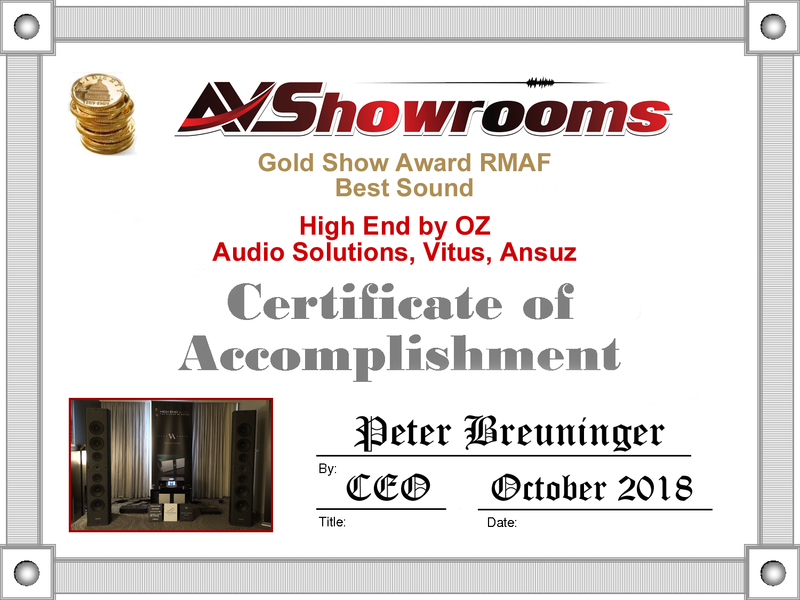 Look for the voluntary third-party endorsement by a show attendee in the AVShowrooms’ video. Once again, it is difficult to find words to properly describe the concert-like experience both Valve Amplification Company and Von Schweikert Audio bring to the listener. 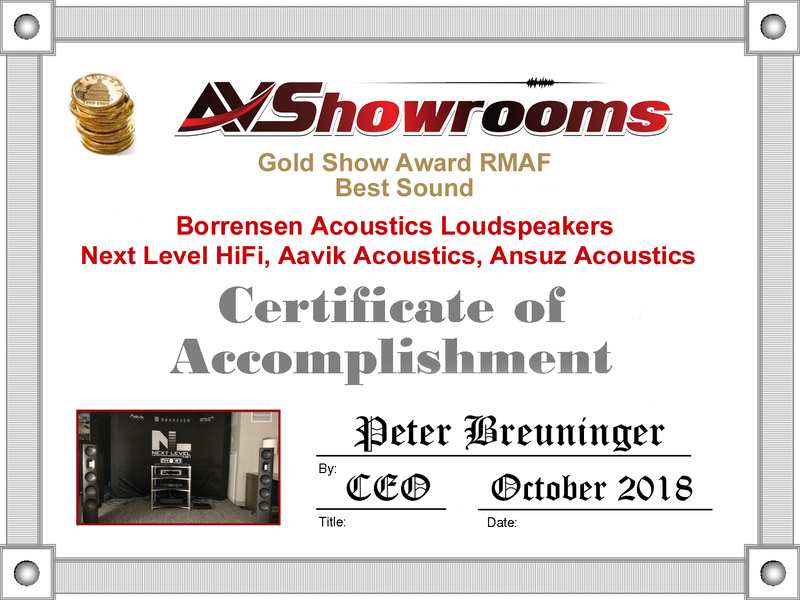 The new Ultra 9 loudspeakers incorporating their technology from their development of the Ultra 11’s will be the focus of an upcoming AVShowrooms’ video interview with both Damon Von Schweikert and Leif Swanson of Von Schweikert Audio explaining their journey, and the technology that resulted in the end product. 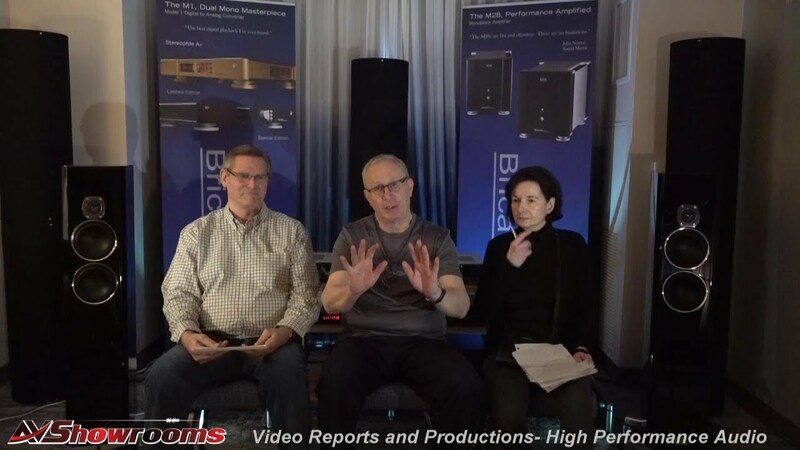 Kevin Hayes, in his own video, does an outstanding job of showcasing his new Statement 450i IQ Integrated amplifier and explaining to the viewers how it took three years to bring the Statement technology to an integrated amplifier. The new integrated is so fast and quiet, unlike any tube integrated I’ve come across at any audio show. Truly a masterpiece in its category. And, speaking of masterpieces, the Ultra 9’s are the perfect loudspeakers to be paired with the Statement 450i IQ integrated. The sound of the “Song of the Stars” track from Dead Can Dance had imaging, tone, impact, micro dynamics and macro dynamics far superior than any other room I heard at the show, or any show for that matter. 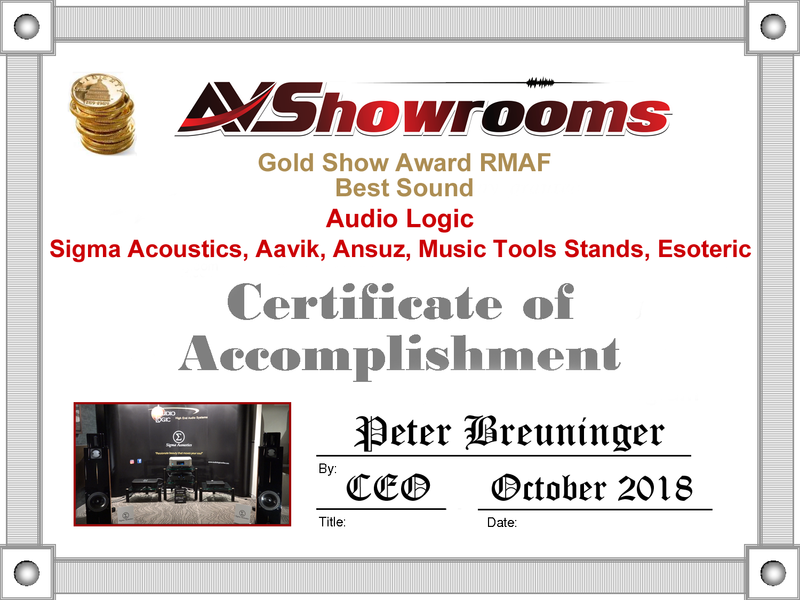 Peter Breuninger mentions in the video that it is the best; however, only to possibly be exceeded in performance in the exhibit room at The Capital Audiofest 2017 with the Ultra 11’s, Von Schweikert’s flagship, and the bi-amped 450 IQ monoblocks. We played vinyl on the Kronos Audio turntable with the SCPS. Cabling by MasterBuilt Audio ULTRA and stands were Critical Mass. The Digital stack included the transport and DAC by Esoteric. Paul Manos of High Fidelity Services and Julian Pelchat of Verity Audio astounded and delighted us with a system worth over 1 million U.S. dollars. The loudspeakers showing were the Monsalvat’s accompanied by two woofer towers using the walls as a horn. The vinyl played was Dead Can Dance’s “Song of the Stars” and the sound came at you and around you in a phase coherent, radiating pattern. The Verity woofer tower and the main tower were perfectly time aligned and the power amplifiers from Verity were a surprising 60 watts per channel. “Power doesn’t mean much” said Julian (more about this on the upcoming video), had me scratching my head, but the truth was in the listen. Easily, one of the best sounding systems at the show. Associated equipment included Verity DAC/Preamp, TW Acoustics turntable with an Ortofon cartridge, Signal Projects cabling and Vibex power conditioning. Saying farewell to the Denver Marriott Tech Center I nostalgically pondered on how in all of the years I’ve been attending RMAF, that its last show at the Marriott ended on such a high note. In my opinion, and contrary to other show reports, this was one of the best overall sounding RMAF’s. However, change is good. Next year the new venue is Gaylord Rockies Resort and Convention Center in Aurora, Colorado, a brand new resort that looks like the size of a small city. It’s now a four day show, (Thursday is trade day) Sept 5 – Sept 8 2019 with many more large conference-sized rooms available and, it was reported from a reliable source, the smaller exhibit rooms are larger and all furniture is removable. Yay! What’s not to like. The ‘fest has moved on. Long live RMAF!